God, I’m so sorry. I had to do it. What is the Stella prize? The Stella Prize runs events and lectures at bookshops, festivals and universities around Australia. We also compile the annual Stella Count, tracking the number of books by men and women reviewed in our major newspapers and literary magazines, and have recently launched the Stella Prize Schools Program. This is the first year I’ve heard of this award but how exciting I caught it before the Big Reveal. I planned to post on the Longlist but time didn’t allow. Before I knew it, my Twitter feed exploded with news of the Shortlist. Karma, my friends, dictates I step in here. I urge you to visit the Stella Awards website and take a look. If the spirit moves, maybe grab one or six of these titles and give them a go. The 2015 Stella Prize will be awarded in Melbourne on the evening of Tuesday 21 April. So you have a bit of time. Oh, come on. One of them? Two? I do not read enough world literature, myself. That’s why I’m encouraging you to step in and pick up some of my slack, so I feel better someone’s doing it. That, and I believe Australian literature gets short shrift, what with all the LOUD and FLASHY prizes such as the, ahem, Baileys and Booker and whatnot. Not that there’s a thing wrong with BIG or FLASHY literary awards. But wouldn’t you like to see Australia’s project get off the ground? I can’t speak to the availability of any of these outside Australia, though a quick look through my library consortium’s catalog found Invisible History of the Human Race. Unfortunately, the weight of what is probably a brilliant work of NF is more than I can take on right now. A novel, perhaps, but DNA is heady stuff. I couldn’t give it the attention it no doubt deserves. Perhaps you can find some of these via Amazon US or UK, your local indie seller or via worldwide Interlibrary Loan. Hell, if you have a blog or write a column or whatever and can give good exposure, approach the publisher or Stella committee. They may be obliging, as they work to raise the visibility of this prize that’s still quite new. Welcome to the fold, Australia! 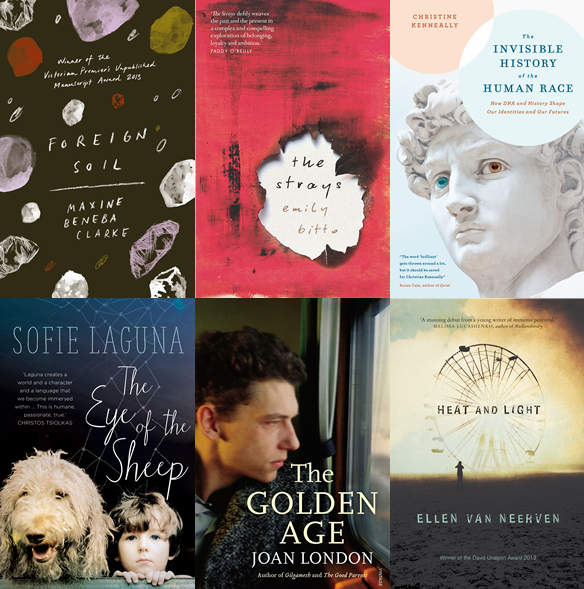 Best of luck to these six authors.